Hoda Muthana describes her decision to join ISIS in Syria, the process for selecting a husband, being a widow with a child and whether she expects punishment if she returns to the U.S.
Do you feel regret for being part of an organization like ISIS? Definitely, it's not islamic at all. Anyone that says so, I will fight against it. Reporter: She is begging for a second chance. I am just a Normal human being who's been manipulated once and hopefully never again. Reporter: Four years ago, when she was 19 years old, she left her Alabama home and hopped on a plane with a plan to join ISIS. She said she had been brainwashed to believe she was answering a higher calling. Reporter: Do you remember the day waking up and saying today is the day? I thought today is the day I need to go. Reporter: The group known for kidnapping and beheading journalist rose to power a decade ago. We'd see dead bodies in public, limbs scattered on the floor. Reporter: Now she says she wants to come home. When I go back, I will larn more and help people not to make the same mistake I have. Reporter: She says the birth of her now 18-month old son changed her. I had a new motherhood instinct that I didn't have before. Reporter: A so-called ISIS bride, married twice to ISIS fighters, her son a product of the second marriage. I hope America doesn't see me as a threat and can accept me. Reporter: Her life overseas drastically different than the one she left in America. She was one ofchildren in an upper middle class family in Alabama which she says was strict. I wanted a more americanized life. I wanted to have friends, go to places. I didn't get any of that. The only way out for me was just to become practicing. Reporter: To become more religious. More religious. Reporter: Her father spoke to ABC news in shadow. At first, he said he was proud his daughter seemed to become more devout about religion, not realizing she was secretly taking cues from ISIS recruiters on her phone. I never imagined that would happen to us, to me, to my family, but it happened to my family. It could happen to any other family. 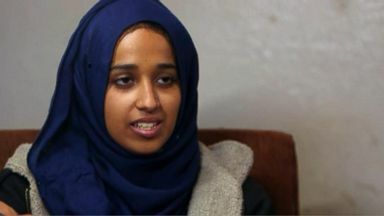 Reporter: She insists she was brainwashed into becoming a radical Muslim after joining a secret Twitter network of roughly 3,000 like-minded members. I had an account on Twitter. And we Normal muslims speaking together. We would just, even rap online together. And I heard and thought it was obligatory for me to go. Reporter: She started encouraging attacks on Americans. I read one of her tweets to her. Go on drive-bys and spill all their blood or rent a big truck and drive all over them. Veteran's, memorial day, kill them. The more I gained knowledge, the more I knew that it wasn't correct. So we had just young people, not knowing much about their religion. We interpreted everything very wrong. Reporter: In November of 2014, she says she told her family she was going on a school trip to Atlanta, Georgia. Once there, she took a flight to Turkey but won't say how she made it into Syria. Reporter: So you're in the safe house and they keep you in raqqah. With locks on all the doors and windows. And guards in front of the locked doors and a guard in front of the guard. . Reporter: And how many would be in the room? At a time about 200 people. Everyone gave their preferences on who they'd like to marry. Were you given a list and you could choose. Reporter: Were you given a list of men and you could choose a man from a list. Does that sound crazy to you now? Sounds very crazy. Reporter: She says her first husband was an Australian of Bangladeshi origin. They were married three months before he was killed in battle. Seen here in photos from his now-deleted social media. Her second husband is now dead. For most of us, it was our first relationship. Remember she married a third time but doesn't know where her husband is now. Six weeks ago, she fled a village not far from where u.s.-backed forces are closing in on ISIS in Syria. Look at it, this is what liberation looks like in Syria. She says she left fearing for her and her son's safety. There was nothing in the market, nothing in the shops. We were eating what was cow food. And we just plucked grass from around our houses and fried it. Seeing him eat grass, that was my last day. Reporter: After spending two nights in the desert, she was captured by kurdish forces and placed in a refugee camp in northern Syria. She's believed to be the only American inside the camp. Can you see why people in the United States would be skeptical of your story that you now say you regret having joined the islamic state, but it's only really because I want to come home. Yeah, I'm sure everyone thinks that, but I hope they excuse me because how young and stupid I was. I have none of the ideology. Reporter: Countries around the world are grappling with the issue of repatriating ISIS brides. President trump has said he wants American ISIS militants brought back to the U.S. To face justice, while asking European allies to take back their ISIS fighters and put them on trial. According to a think tank, at least seven people have returned to the U.S. And faced charges. Do you think you deserve punishment for what you did? Maybe there will be lessons, a process that will ensure we'll never do this again. Jail time, I don't know if that has an effect on people as well. I need help mentally as well. I don't have the ideology any more. Reporter: She says she may face legal consequences. She is absolutely disgusted by the person she became while under the spell of these, you know, brainwashing monsters. Reporter: The U.S. State department today said it's looking into these cases to et better understand the details. Now you want America to come and get you. I hope so, yeah. I'm almost cried myself to sleep every day because I know that when I do get back I probably will be sentenced to jail for I don't know how much time and thinking that my last few moments with him is stuck in a prison before another prison. 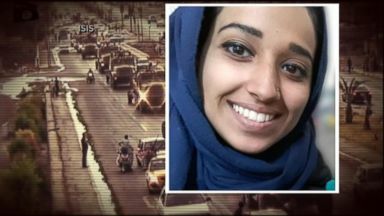 Hoda Muthana, of Alabama, claims she was lured and brainwashed by ISIS four years ago and is now hoping to return to her family in the U.S. 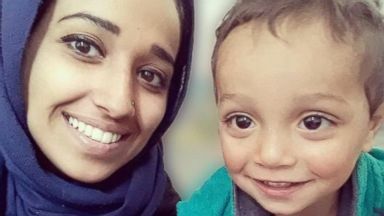 In a letter exclusively obtained by ABC News, Hoda Muthana said she'd been an "arrogant" young woman who didn't listen to her family. 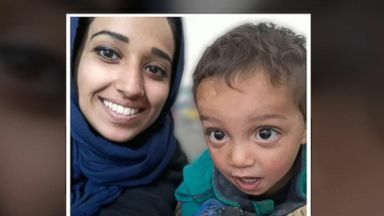 Hoda Muthana's gives her first interview, explaining why she left Alabama at age 19 to join the terror group, and now wants to return home 4 years later with her 18-month-old child.